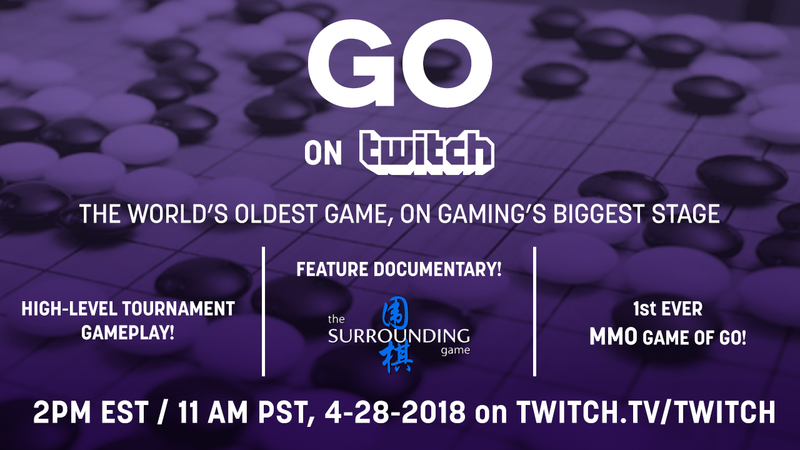 This Saturday April 28, The Surrounding Game documentary and Open Study Room are teaming up with Twitch.tv to host what Will Lockhart — with some justifiable hyperbole — calls “the biggest introduction to Go in history!” Twitch is the #1 online gaming platform in the world, with an estimated 100 million users per month. Their first special program on go, “Twitch Plays Go,” will be broadcast live on the main channel - twitch.tv/twitch - starting at 11am PST, April 28. Twitch’s introduction to go for the greater gaming community will feature a tutorial on the rules of the game, a special showing of The Surrounding Game documentary with Q&A, the first-ever massively-multiplayer online go game, and live commentary on the 2018 Creator’s Invitational tournament and College Go League Championship with organizer Stephen Hu and pro player/Go streamer Hajin Lee.